Gentle Scale Modelling: Moving on to pastures old! Moving on means that I am starting making the Testors (née Italeri) T-45 Goshawk to make a US Navy trainer pair next to the Buckeye. I know that this kit is based on a pre-production prototype and isn't fully in agreement with the versions in service. 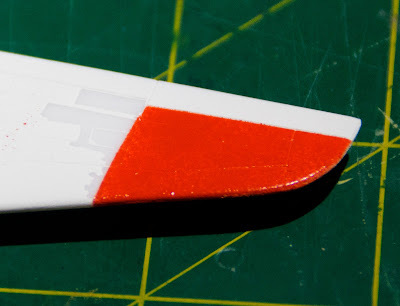 However, it is the only T-45 kit available so it will have to do.There is an article in an old Fine Scale Modeler that describes how to update it but I can't find a copy of that. The kit has gone together very nicely up to now. 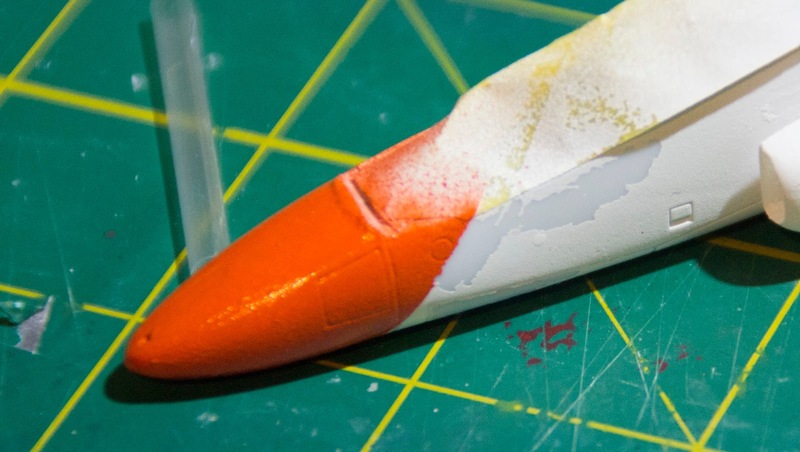 I had to use a bit of filler on a wing join and on one of the nacelles but they were minor problms. The biggest issue is that I am back to using the Modelmaster International Orange Enamel. I don't like enamels. I haven't used them for years and I can't get used to the fact that they don't dry very quickly.The orange here was tacky for 30 hours or so. This is where I am with it. As you can see, the orange has gone on OK but in both pictures you can see that the masking tape has taken off some of the white. This is in spite of the whte being a AK Interactive primer and having a coating of Johnson's Klear on top! The final image shows just how I didn't mask enough so I now have a lot of overspray to deal with. 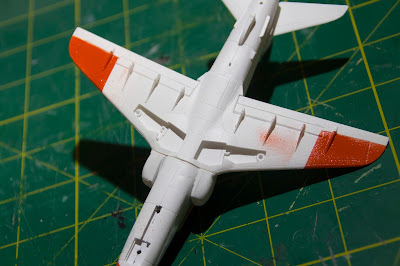 Fortunately, the white primer will not only go on well but will dry quickly! Now to the 'pastures old'. I have been looking for something a little different to do this year. 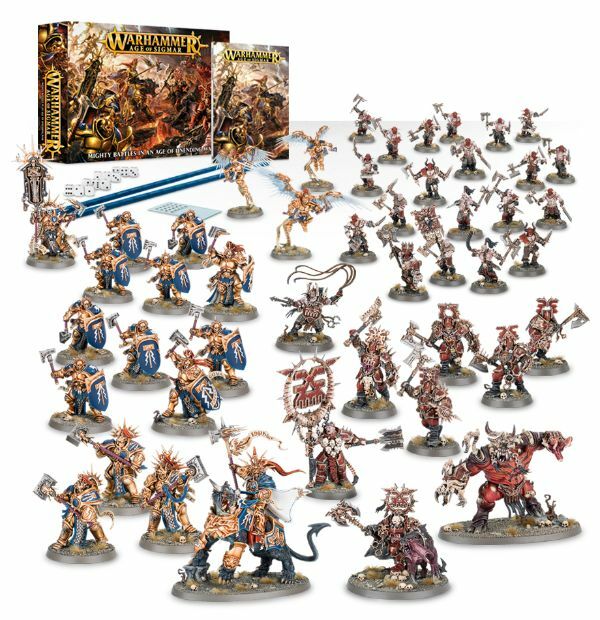 Valerie bought me the 'Age of Sigmar' starter set from Games Workshop. I have spent a few hours watching a video on painting the figure sets in the box. 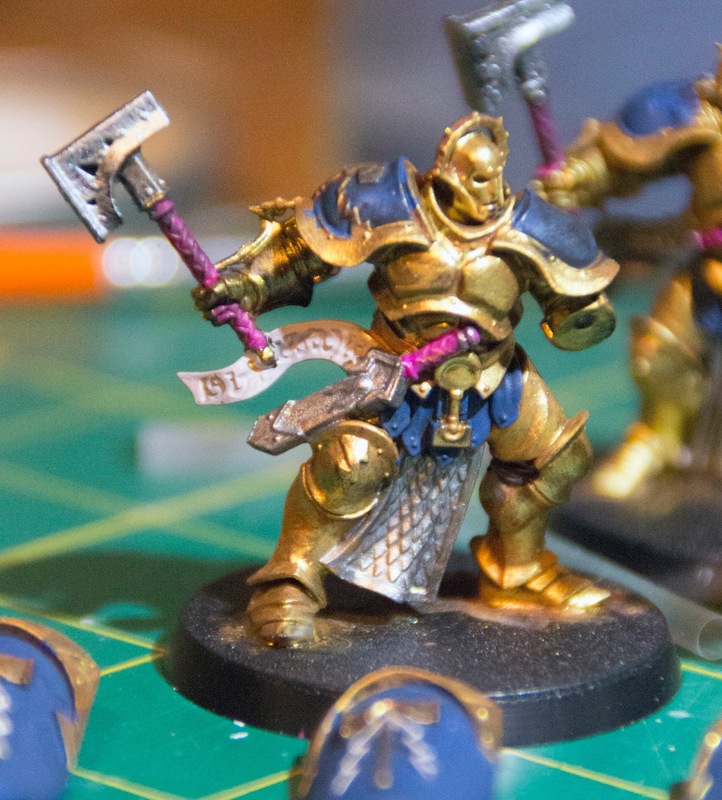 I spent a lot of time considering what to do about paints as Games Workshop have their own range. Going through the videos, it seemed that I would need 51 different paints/washes etc. Pricing this up resulted in a total cost of £137.70! I sent a Facebook message to the local GW shop manager and asked what he thought. His response was that I should use the recommended paints. This didn'tseem like a reasonable response. In my shop, I would have tried to find a compromise that might have reduced the cost. I then reviewed what I had (as I have a good stock of paints left over from SBX) and found that, at full retail, I had over £500.00 worth of paint. I decided to go with my own paints except for getting a set of the special extra opaque Game colours. I ordered these on Boxing Day (Staturday) and they were delivered on the Sunday. You can't beat Amazon for service. 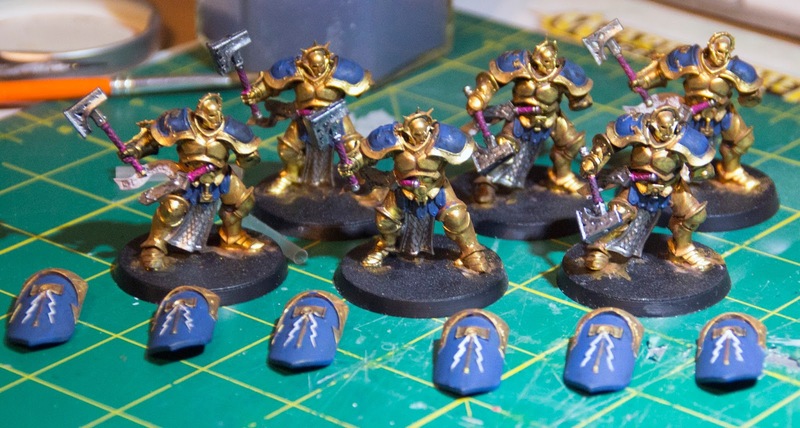 Anyway, off I went and had a go at the first 6, know as Stormcast Liberators. Here they are about halfway through the process. The figures are only 45mm high but are extremely well moulded.The detail is very sharp and easy to follow with a brush. I have gathered together a special set of brushes including a couple of nice flat ones. Again, these all came from my ex-SBX stuff. The painting consists of a three layer process. Taking the gold as an example, you paint the gold; apply a wash of a flesh coloured wash; re-apply the gold on the highlights. The gold that I am using is one of a set of three Dark Star golds that I bought at the Wivenhoe show. More soon.